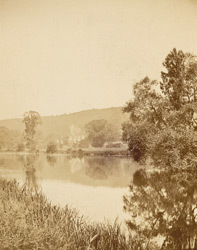 "On the same bank of the river as Mapledurham, on a wooded slope, with a beautiful lawn declining to the water's edge, and adorned with many a fine and stately tree, is another ancient Tudor mansion, Hardwick House, built of red brick, once the seat of the ancient family of Lybbe, and now that of their descendant, P. Lybbe Powys, Esq. It also has its tale of the Civil War, having then been frequently pillaged. It is in the parish of Whitchurch, Oxon."